Do I Have Hearing Loss? 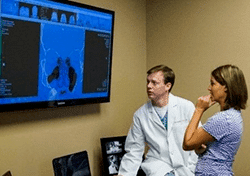 At ExcelENT of Alabama, Dr. Davis takes pride in evaluating each patient by obtaining a complete medical history and performing a thorough head and neck examination during the first office visit. We strongly encourage you to use our secure web portal to ensure a complete and accurate medical history. When you come to ExcelENT of Alabama for a complete ear, nose, and throat examination, Dr. Davis will complete a full inspection of your face, ears, nose, throat, and neck. During the nasal examination, Dr. Davis uses a handheld speculum and headlight in order to examine your nasal septum and turbinates closely. In addition, your nose will often be examined before and after application of a decongestant nose spray. If you are complaining of nasal, sinus, or allergy problems, a nasal endoscopy will be used to get a better view of what could be causing the issues. Before the procedure, one of our highly trained nurses will spray your nose with a decongestant combined with lidocaine. Then, Dr. Davis will place a small telescope in each nostril in order to obtain a closer view of your nasal passages to see if any abnormal swellings/edema, enlarged turbinates, nasal polyps, septal deformities, and sinus drainage can be identified. In all cases, Dr. Davis will display the endoscopic image on a television monitor, so that you can better understand your condition. We want you to be as much a part of your treatment plan as we are! Therefore, it is important for us to always keep you in the know. Should Dr. Davis determine your condition is due to chronic sinusitis, he will likely attempt medical management of your sinus condition first. If after attempting these aforementioned therapies, Dr. Davis and you determine that the use of medical management is still not helping you to find relief of chronic sinusitis, a CT scan of your sinuses will most likely be recommended for further evaluation. Our Carestream Point of Care CT scanner allows Dr. Davis to see the detailed anatomy and contents of all the sinuses. Dr. Davis offers the immediate availability of a two-minute scan in our own office, saving you a separate trip to a radiology center/hospital and, then, a second visit with us to discuss the results. The test is commonly used to document chronic sinusitis and to evaluate the potential benefit of balloon sinuplasty or endoscopic sinus surgery. Our open-access, special-use scanner exposes you to 80-90% less radiation than full-size scanners at a hospital. After the CT scan is obtained, Dr. Davis will spend 30-40 minutes discussing the findings on the CT scan with you, as well as illustrate how those findings relate to your sinus symptoms. If surgery is recommended by Dr. Davis and desired by the patient, he will thoroughly discuss surgical options using state-of-the-art patient education computer modules. To schedule an appointment with one of our Birmingham ENT specialists, call us at (205) 988-6858, or send us an appointment request. © 2019 ExcelENT. All Rights Reserved.